The arrival of the fresh 2018 harvest of wonderfully springlike bright green Villa Montalbano Extra Virgin Olive Oil coincided with a very hungry teenager during a wet weekend in March 2019. The result was the creation of some delicious Italian Crostini, using our fresh Villa Montalbano Extra Virgin Olive Oil, which were generously shared with all the family. 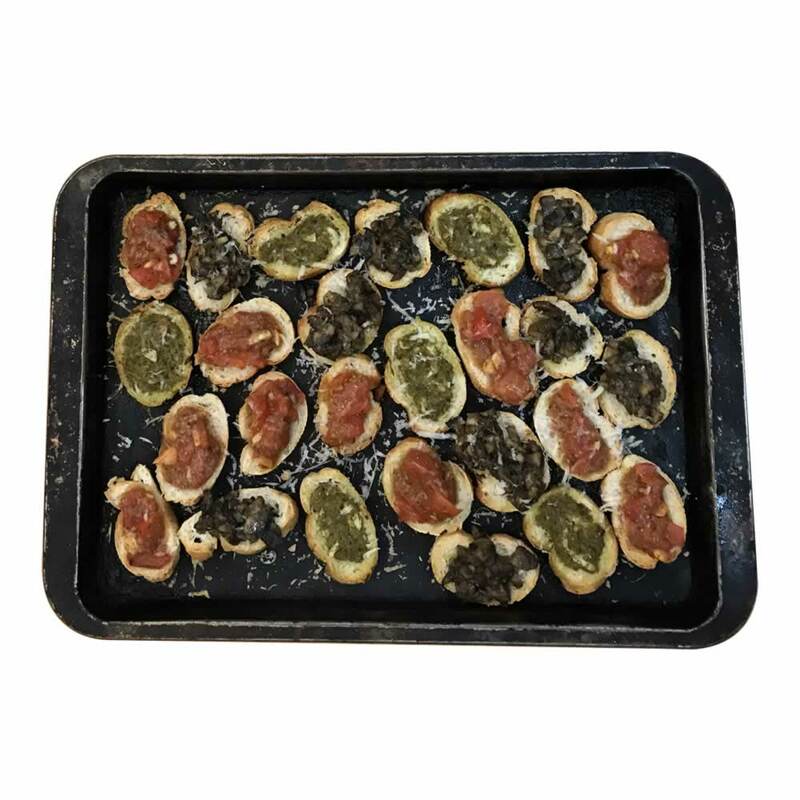 Ever since our visit to Villa Montalbano Estate in 2002, to check on the olive harvest when the children were tiny, we have all raved about the enormous trays of crostini produced by Silvana, a lovely local neighbour of the Estate, which we wolfed in moments. Flora's Fabulous Crostini came deliciously close. Crostini are often used as a quick and delicious starter in Italy, or as something to nibble on during a drinks party. First slice the baguette into thin rounds, and lay the slices on a baking tray. Bake at about 180C in the oven for about 5 minutes until the bread feels crisp and is just beginning to brown. Don't be tempted to leave it too long. Topping 1: Chop the mushrooms fairly finely and soften with olive oil and garlic in a pan. Season to taste. Spoon onto 1/3 of the baked crostini. Season with salt and pepper to taste. Topping 2: Finely chop ripe fresh tomatoes and mix with a spoonful of pesto, olive oil, salt and pepper. Spoon onto the 2nd 1/3 of the baked crostini. Topping 3: Mix some pesto with a liberal amount of Villa Montalbano Extra Virgin Olive Oil to make it a slightly runnier consistency than the jar variety. Spoon onto the remaining crostini. Return to the oven and bake for 5-10 minutes more. Grate fresh parmesan or pecorino over the crostini and serve. 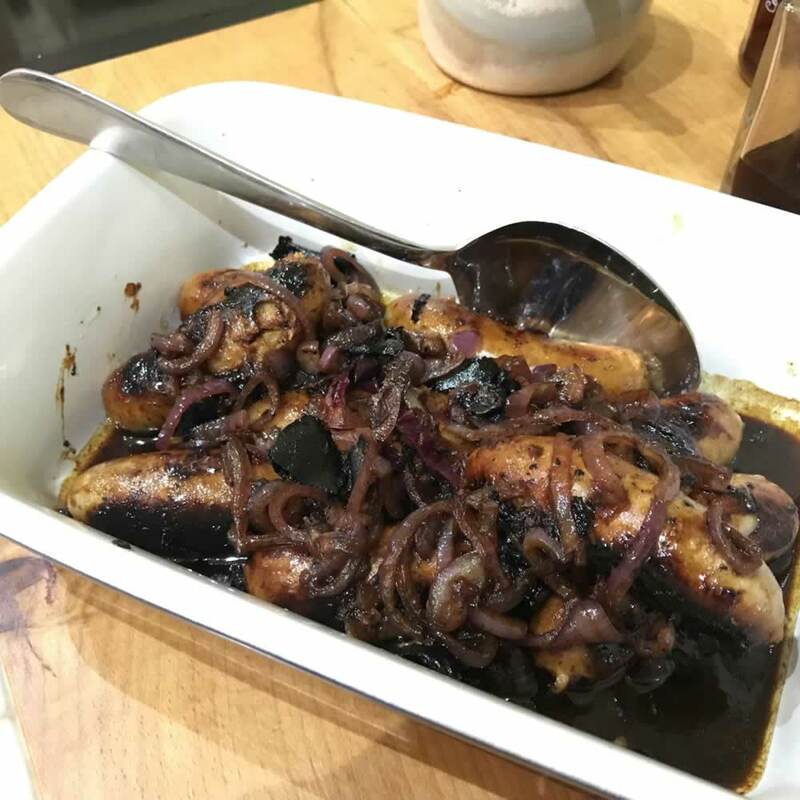 It was in the knowledge of the Bramble's amazingly beneficial properties that I embarked on making this delicious warming winter dish, using our popular Bramble Scotch Whisky Liqueur 23%, bolstered by the knowledge that it is doing us countless other goods! Fry the sausages in a heavy based frying pan turning them frequently. (the sausages shouldn't need more fat added to the pan if cooked patiently so you needn't feel too guilty about extra fat content!). Once they are well browned and cooked through remove them to a warmed serving dish and keep warm. Add the sliced Onion to the pan and gently soften in the remaining sausage fat, allowing to gently caramelise. Once the onions are cooked to your taste turn the heat down and add the Bramble Scotch Whisky Liqueur. Allow it to bubble gently and thoroughly deglaze all the delicious sausagey bits from the pan. Once reduced to a slightly syrupy consistency pour over the sausages and serve with buttery mashed potato and plenty of green beans or mange tout. The Tale of the Brilliant Bramble - When is a Bramble a Blackberry? This is a fantastically quick and easy salad recipe using our first class Kabbadates Extra Virgin Olive Oil, that I use regularly to accompany our light lunches or sometimes a slightly heavier supper dish at home. Using a fork, prod out the garden peas into a bowl, rinse and drain. Add a small amount of roughly chopped fresh apple mint. Dress with Kabbadates Extra Virgin Olive Oil and Apple Vinegar and stir gently until well mixed. Serve alongside your favourite light lunch or use as a healthy starter on its own. Happy munching! I experimented with our new White Truffle Oil and the result was this indulgently rich pesto slathered on some tagliatelle pasta and pan fried chestnut mushrooms. Served with a simple rocket salad and a glass of white burgundy it made an indulgent and intensely flavoured summer's supper. This is my recipe for tagliatelle with White Truffle Oil Pesto and chestnut mushrooms. In the food processor put 50g fresh rocket, 1 garlic clove, 30g crushed walnuts, zest of 1 lemon, 30g grated parmesan, 60ml White Truffle Oil and 60ml Monterosa Extra Virgin Olive Oil and blitz to a sauce. Add salt and pepper to taste. This won't be as smooth as pesto from a jar but that's part of its appeal. Gently pan fry in a tablespoon of Monterosa Extra Virgin Olive Oil a generous helping of thinly sliced chestnut mushrooms until the mushrooms are just beginning to crisp. Stir the pesto through tagliatelle and then toss the mushrooms gently through the pasta. Serve with a shaving of parmesan on top and a rocket salad and truffle in! It is now public knowledge that I absolutely love pasta! Regardless of how hungry I am, I always have room for pasta especially when it is a simple dish using deliciously fresh ingredients. My Tayberry and Asparagus Tripoline recipe, using our deliciously fruity handmade Tayberry Vinegar is exactly that. Simple to make, magical to eat and with tiny amounts of washing up required. I urge you to have a go at trying to make it. Chop onion, garlic, bacon, asparagus and watercress before you start. The asparagus spears should only have their hard ends removed, the other elements in chunks. Soften the onion, garlic and bacon in a heavy based frying pan with a splash of our Villa Montalbano Extra Virgin Olive Oil. At the same time, in a separate pan, cook your pasta. Once contents of frying pan has browned, add a good splash of Tayberry Vinegar to the mix and allow onion to caramelise slightly. Cook your asparagus for just 2/3 minutes over boiling water, ideally use your pasta water and until both pasta and asparagus are "al dente," firm but not hard. Add the cooked pasta to your frying pan, mix well with the onion, garlic and bacon so all the lovely juices coat the pasta. Then add your fresh watercress. Stir quickly on a low heat and finally season with salt and pepper. (NB. Do not be tempted to cook too long after adding the watercress or you will ruin the desired raw nature of the watercress and it will turn stringy!). Serve on large warm plates, laying your cooked asparagus spears on the top of the dish. Finally drizzle a little more Tayberry Vinegar and Olive Oil over the dish before grating parmesan cheese, salt and pepper on as required. An accompanying side salad of green leaves, cucumber and tomatoes, dressed with more Tayberry Vinegar and Villa Montalbano Extra Virgin Olive Oil, and a good dry white table wine to drink will make this recipe a most excellent treat for lunch or supper. British asparagus season is sadly short, starting officially on 23rd April and runs through until 21st June each year. It is such a fantastic tasting root vegetable, creating a buzz of excitement each year in our family to the point where we almost overdose on the stuff! There are many great recipes that use asparagus, such as our Pici Asparagus with Balsamic for example. However, non are as simple as this one, our Scorched Asparagus Spears. Using the very best of our ingredients to dress the asparagus can produce a quick starter or a light lunch in literally minutes. Wash the asparagus spears thoroughly and then trim the root ends by about an inch to remove just the stringy section. A good tip to know where to cut or break the speak is to hold the root end between thumb and forefinger in one hand and the centre of the spear in the other. Bend the shaft until it snaps. Consume the top section and use the remainder for soup later. To cook, simply place on a hot BBQ and turn as the spears scortch. Do not be tempted to overcook as they dry out, this process should only take about a minute or two maximum. Cooking can also be achieved in a very hot frying pan. Once cooked lay on the serving plate and dress with a little 25 Year Old Tagliavini Aceto Balsamico di Modena Extra Vecchio, then generously with Villa Montalbano Extra Virgin Olive Oil before finally cracking salt over the dish to taste. The asparagus can be served on its own for starter or with parma ham and salad to make a light lunch. A brisk yomp up a hill in the sunshine with an ecstatic dog this morning has left me ravenous and looking for a reward for such toil. Our new Cretan Sitia Extra Virgin Olive Oil beckons and I am already anticipating an evening drink at the garden table accompanied by some traditional Bruschetta. This simple recipe, otherwise known in Tuscany as Fettunta, is the traditional way of savouring the first olive oil harvest of the season. Since the sun is now shining here at Demijohn HQ we shall enjoy it as a celebratory herald of the great summer we have had! Slice the bread thickly and toast it until just golden. Slice a garlic clove in half and rub the bread with the clove all over. Drizzle generously with the olive oil and eat immediately. 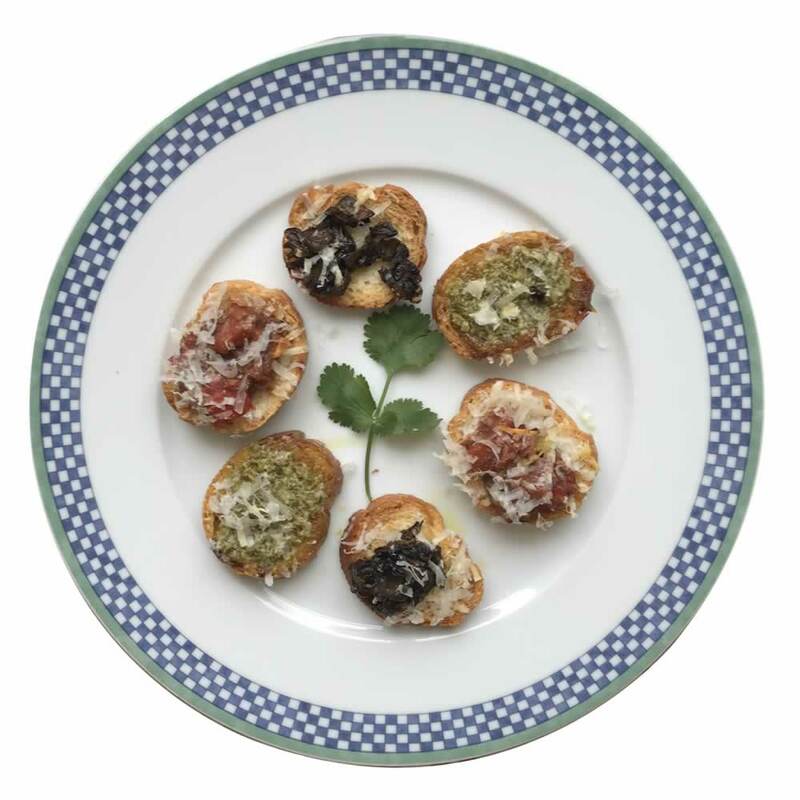 Adorn your bruschetta with a basil leaf or some anchovies if you're feeling exotic! This is a quick and easy salad recipe that not only tastes delicious, it takes seconds to prepare and is pretty healthy too. Our simple Tomato and Basil Salad is wonderful for making lunch a little more fresh, and great for a low stress dinner party starter idea. And if you grow your own basil and tomatoes, as we do, then as we have found it is a great way to use up a glut of homegrown produce! Slice your fresh tomatoes and lay in a shallow dish or plate. Chop a ball of Mozzarella into slices or chunks and lay on top of the sliced tomatoes. Remove fresh basil leaves from their stems and sprinkle generously over the whole dish. Crack over some salt and pepper, adjusting for your own personal taste. Then drizzle first 12 Year Old Balsamic Vinegar over the salad, then more liberally, our Sitia Extra Virgin Olive Oil. The order of vinegar then oil is important, as the oil will wash the balsamic vinegar through the salad giving you a more rounded dressing. This dish can be made either in a single layer or mutiple layers depending on numbers to be fed. It can be served with nice thick homemade wholemeal bread or ciabatta. If you haven't got Mozzarella to hand then try this dish with flakes of parmesan cheese, a surprise is in store! As the blossom is now exuberantly blossoming outside Demijohn HQ it is a delight to bump into the occasional bumble bee during my increasingly frequent forays into the garden. I hope soon to start encountering a honey bee too and such thoughts bring Mead to my mind. Mead was something I had rather dismissed as belonging to a time of wenches and wassailing until we found our Traditional Mead 14% and discovered a much dryer, more perfumed drink than I had imagined. Its strong floral flavours survive the rigours of cooking and so I was rather excited to find this recipe for a Moroccan style Chicken dish last week. Season the chicken thighs with salt and pepper and then brown the pieces in olive oil in a heavy frying or saute pan for about 5 minutes each side. Remove them to an ovenproof dish and scatter the apricots over and around the chicken. Pour off all but 3 tbsps of fat from the pan and soften the onion in it, adding the garlic and ginger followed by the spices and remaining salt and pepper once the onion is almost completely softened. Add the Traditional Mead to the pan, deglaze and simmer for about 5 minutes until the juices thicken slightly. Pour these over the chicken, cover the dish and bake at 180 degrees celsius for about 1 hour until the chicken is thoroughly cooked. Remove the cover 10 minutes before the end of the cooking time. Toast the flaked almonds in a dry frying pan and sprinkle them over the chicken before serving with couscous. I absolutely love pasta! Well done Italy for inventing such a food. However, you do need to have the odd inspirational thought when creating a pasta dish to ensure you don't get stuck in a "Pasta Bake Rut" or PBR for short. Messing about at the stove last week I came up with this delightful little dish using fresh British Asparagus which has just come into season (and thanks to the long Winter, I do mean just!). My pici pasta with asparagus uses our 25 year old Balsamic Vinegar and is fabulously quick to make. It also serves two good eaters, is superbly easy to wash up and whoever you are making it for will think you are a legend in the kitchen. So how is it done? Chop onion, garlic, pancetta, asparagus and coriander before you start. The asparagus spears should be chopped in thirds, the other elements in chunks. Soften the onion, garlic and pancetta in a heavy based frying pan with a tbsp full of Kabbadates Extra Virgin Olive Oil. At same time, in a separate pan, cook your pasta. Once browned, remove the onion, garlic and pancetta from pan and place to one side keeping warm. Add asparagus to pan and fry hard until the spears are looking scorched in places. Add back in the onion, garlic and pancetta mix, chopped coriander and another tbsp of olive oil. Now check pasta is ready, it should be "al dente," firm but not hard, drain and add to frying pan. Season with salt and pepper and mix contents of frying pan well on a low heat. Serve on large warm plates and drizzle our 25 year old Tagliavini Aceto Balsamico Extra Vecchio sparingly over each dish, adding grated parmesan cheese as required. An accompanying salad of green leaves, dressed with our Kabbadates Extra Virgin Olive Oil, and a good rich red table wine to drink will make this dish fit for any dinner party. Forget the PBR issue, anyone hungry? I had an experimental evening last night with duck breasts and a discovered remnant of Demijohn Sloe Gin 25%, a leftover from a very energetic massed sledging outing only a couple of months ago. The verdict: a success, improved with a splash of lemon vinegar. Slice the shallots thinly and soften in a frying pan using the tiniest smidgen of olive oil. When softened set the shallots aside in a warmed dish and wipe the pan clean with kitchen roll then heat the pan to smoking hot. Having scored the skin of the duck breasts and seasoned with salt and pepper fry them in the pan for about 5 minutes until the skin is just starting to crisp. Drain the fat from the pan and turn the duck breasts over, cooking for a further 3-4 minutes until the meat is still just pink inside. Remove the duck breasts to the dish of shallots and lower the heat under the pan. Now slake the pan with the Sloe Gin, allowing enough to make a jus for each duck breast. Remember that the gin will reduce in quantity so don't be too sparing. Add the star anise and bubble the gin until it reduces by about a third and takes on a slightly syrupy consistency. Add a dash of lemon vinegar and season with salt and pepper to taste then pour this jus over the duck breasts. Served with creamy mashed potato and mountains of springy green vegetables this seems to be quite well received! This recipe has been kindly sent to us by Angela Wilson in response to our call for recipes using our products. 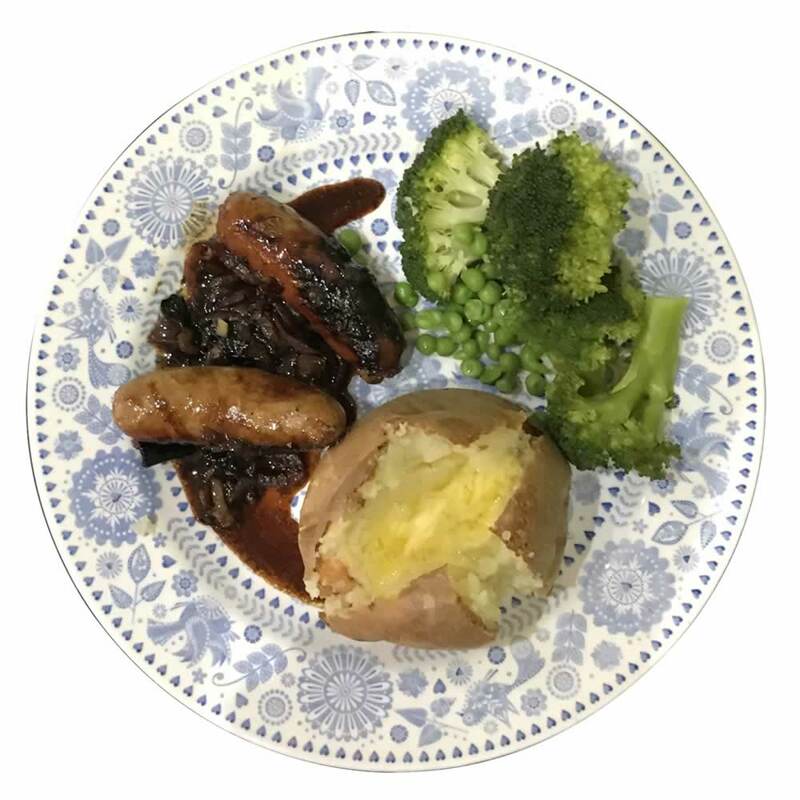 Angela has been rewarded with a £30 demijohn gift voucher as a thank you for this wonderful recipe. Put the ham into the tightest fitting pan you can find and cover with the cherry coke. Bring to the boil and simmer for approximately 2 and a half hours (for a ham for 4-6). Preheat the oven to 200C. Remove the ham from the pan after simmering and place it on a roasting tray on top of some foil and cut off any extra fat layer on the top, leaving just a thin layer. Score diamonds into the fat and stick a clove into each diamond. To a saucepan add the cherry jam, Demijohn Morello Cherry Brandy, the Demijohn Raspberry Vinegar and the smoked paprika. Stir over a high heat constantly until the glaze thickens. When ready, pour over the ham, and roast in the oven for 20-30 minutes. Let it rest before carving. The author recommends that this goes particularly well with a glass of Morello Fizz. If you like cheese and need something for your nibbles at a drinks party, then this might be the perfect soloution. Puncture the cheese several times with a knife. Dribble the Cider Brandy over the cheese allowing it to soak into the puncture holes. Place the cheese in a preheated oven (to 180C) and allow to bake for 15 to 20 minutes until runny. Eat immediately - dunk crisps and repeat! John Quigley’s Hot smoked salmon, ruby grapefruit, shaved fennel, pistachio and watercress salad with minty crème fraiche and Bramble Vinegar dressing. 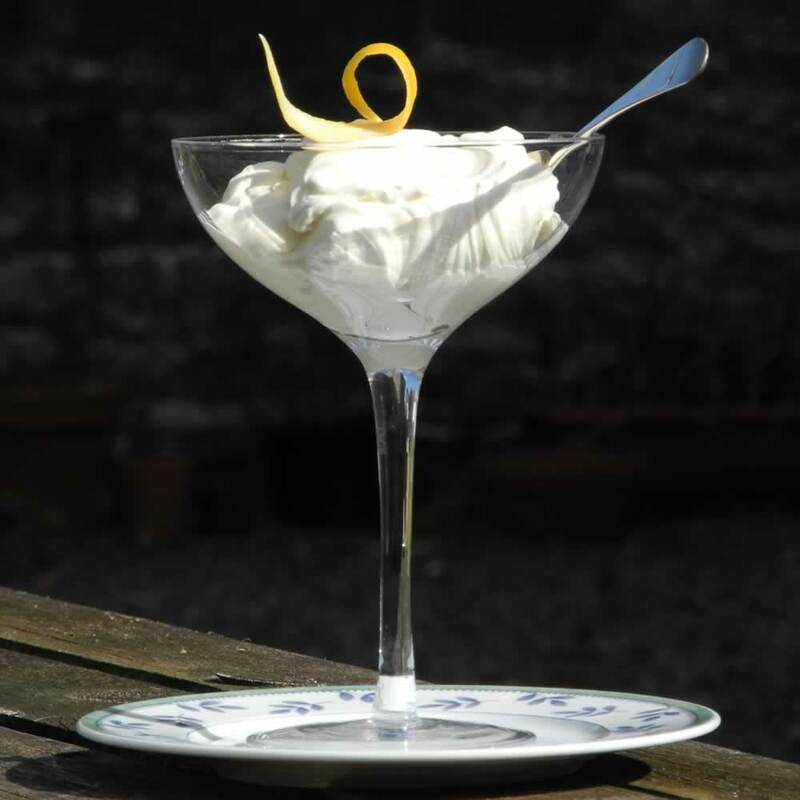 Combine the crème fraiche, bramble vinegar and mint sauce in bowl and mix together, ideally to the consistency of single cream, if not add a little water. Divide and arrange the grapefruit, fennel, watercress and salmon between 4 plates, drizzle over the dressing and sprinkle on pistachios. John Quigley is Chef and patron of the well respected Red Onion Restaurant in Glasgow and is always welcome at Demijohn! This is a simple to make vinaigrette which was first invented by Mrs Wilson of Biggar, one of many enthusiastic Demijohn customers. Add the Elderflower Vinegar and Yorkshire Lemon Rapeseed Oil to a jug with a wide neck. Grate a small amount of lemon jest to the mixture. Adjust for salt and pepper. Pour complete mixture into an old Demijohn bottle of at least 300ml capacity and shake vigourously. Use to dress green leaf salads. Delicously delightful, thankyou Mrs Wilson! If you have ever thought that chicken needs a little help to become interesting, we this recipe might be just the ticket! Soften 25g sliced shallots and 2 peeled cloves of garlic in 20g of unsalted butter. Add 5 sprigs of thyme and 1 bay leaf and cook for a further 2 minutes. Add 50ml 10 year old West Country Spirit and reduce down to almost nothing. Add 500ml chicken stock and reduce by half, then add 50ml double cream. Whisk in 180g unsalted butter in small pieces and season with salt and pepper. Delicious served with chicken, but is also great with pork. 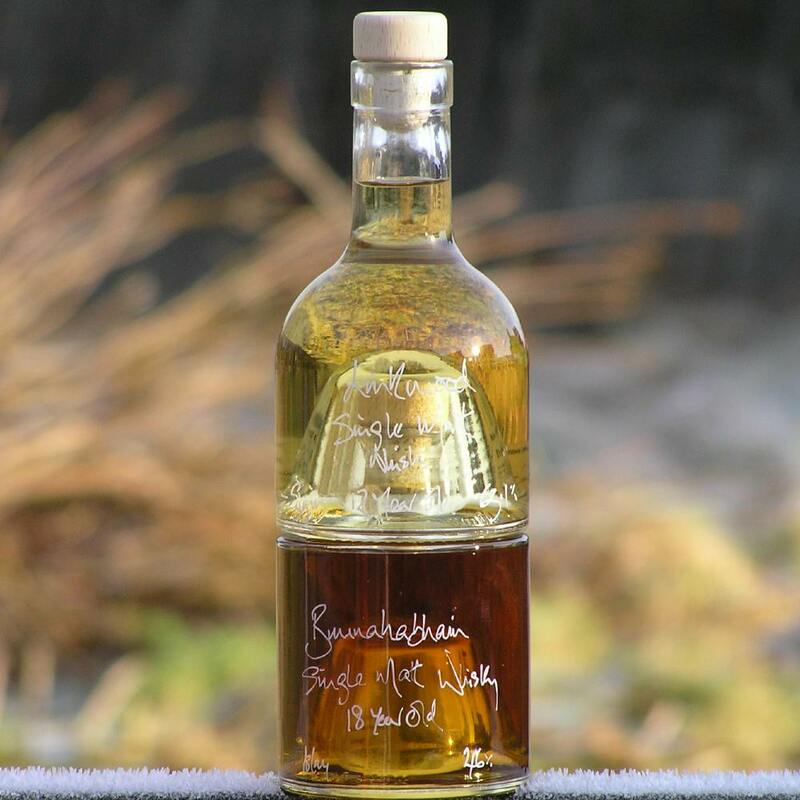 A generous glass or two of our Bramble Scotch Whisky Liqueur 23% stirred into the juices of a roast duck or venison joint will make a gravy that will add enormous joie de vivre to your dish. So simple anyone can do it! If you like to taste your food, then this pork dish using our handmade Ginger Wine 14.5% will impress. Slice the pork fillets in half lengthwise without cutting right through. Flatten them out and beat them, then cut across the centre to make 6 escalopes. Coat them in flour seasoned with salt and pepper. Heat a generous splash of olive oil in a pan and sauté the escalopes for about 4 minutes each side until cooked through. Remove them and keep warm. Add the Ginger Wine, lemon juice, and 56ml water to the pan, stir well and reduce to half. Stir in the sour cream and 3 pieces of ginger preserved in syrup, drained and chopped. Bring it to the boil again until the sauce thickens and then serve poured over the escalopes. Serve with mashed potato and mountains of gently steamed leaf spinach. Delicious!